Imagine a huge white canvas placed on an artist’s doorstep. With time, although initially virtually untouched, it starts to have some scratches, blemishes and faint traces on some parts. Yet, the artist does not touch or use this canvas for years, propping it up against the studio wall in view every single day. Until one morning when color strokes start to appear and inspiration has taken over. The artist is finally ready to paint. This is Beirut today, a five thousand year old multi-dimensional city that is like an open canvas. For years, street walls, bridge tunnels and scattered buildings were begging for life and had to be content with badly sprayed store signs and names of politicians more fit as toilet scribbles than street art. All of this started to change as color, social messages and designed graffiti was introduced. Today, the graffiti art scene is booming in a continuously tight and tense socio-political situation. What has finally triggered this change? And who were the protagonists? This article was featured on Hala Abdul Malak’s Blog website (www.thedesigncritic.com) on May the 11th, 2009. Historically, graffiti is usually any form of illicit expression, drawing or writing on a public surface that may or may not be gang-related. It then evolved into pop culture, usually associated with underground hip hop music and break dancing, generally concealed from the masses. The dichotomy that exists around this form of creativity ranges from artistic considerations to notions of vandalism; but that is another debate. 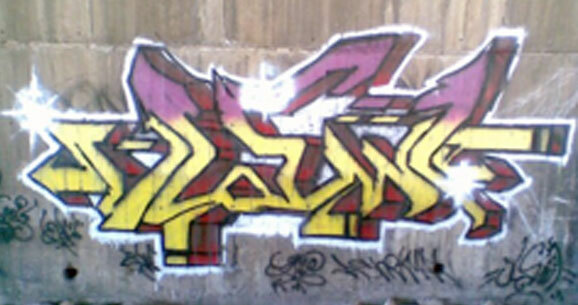 Lebanese graffiti art started with three major contributing teams – P+G, REK and Ashekman. Heavily influenced by their Western counterparts, these young designers have frequently been expressing themselves through various visual styles. Parekour+Graffiti (P+G), a group of friends spraying together since 2006, have turned all the empty walls of the streets of Beirut into potential canvases. They emphasize on a different viewpoint and express themselves while remaining distant from political connotations. They acquire their inspiration from the actual streets and tend to create a visual culture that belongs and interacts with the landscape and the people. Their work is focused less on words and more on characters with an emphasis on bright and vivid colors. Their positive energy is clearly reflected in their art, thus creating uplifting and enriching visuals that help brighten the city. Always trying to enhance their results, this crew is all about self-improvement and getting better mural opportunities by experimenting with various sprays and techniques. The Red Eyed Kamikazes (REK) are the artists behind well-known key phrases like: “Beirut La Tamout” – Beirut Doesn’t Die, “Beirut Law Hakat” – If Beirut Spoke, and “Li Beirut” – For Beirut. These have become logotypes that have popped up in various places, even on handbags, promoting messages of unity and harmony. Influenced from the utterly chaotic situation in Beirut and trying to reclaim the streets by the average youth, REK are all about sharing the passion and love of this great city. By detaching themselves from political messages, they have reclaimed the streets by expressing a harmonious streamlined theme: Beirut, “the shaab” – its people. Originally founded by Sari “Fish” Saadeh, Rami “Ze m3allim” Mouallem, and Raul “K-Breet” Mallat, REK are a growing bunch of artists now composed of seven members. In a recent interview with Arab TV station Al Jazeera, REK crew came out of their anonymity and talked to the press for the first time. They explained that they usually work at night to be comfortable and avoid being seen. Their positive vibes and united spirit has certainly rubbed off, beautifying a city whose walls are still covered with remnants of bullet-holes and grey spots. Their style varies from visual icons to a modern Arabic fusion of calligraphy and type. Their work also includes Arabic that is mirrored in successful integration with Latin. One of the establishers of Beirut street art is Ashekman, a hip-hop Lebanese duo composed of twin brothers Omar and Mohamed Kabbani. 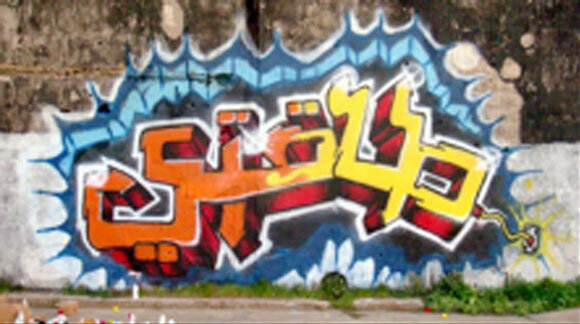 As one of the pioneers in Lebanese Arabic Graffiti with around eight years of experience, their work stands out from the crowd because it is based on modern Arabic Typography. They started their street art literally on the streets, in alleys, under the bridges and in abandoned train stations. Now, they are also commissioned to create designs in apartments, on offices walls, canvases and T-shirts. Inspired by Beirut’s rough urban scene, Ashekman’s rap songs are about the mass Lebanese society in general. As graphic designers, the brothers decided to merge this expertise with their passion for hip-hop all within an Arabic context. Unlike other groups, Ashekman’s work is influenced by the pre-existing political writings. Militias in Beirut used to tag walls with their emblem during the war, marking their territories and today various political leaders have tagged their figures stencils all over the city. Ashekman’s politically influenced messages take certain innuendos and turn them to the group’s benefits. Examples range from “El Sheri’3 Elna” - The Street is Ours, (implying that they control the streets using their art as weapons), “El 3youn 3a Beirut” - All Eyes on Beirut (indicating that Beirut has become a playground for the regional powers) and their recent dedicated graffiti for Gaza, “Gaza fi Qalbi” - Gaza in my heart. While others still work with the Latin type or base their designs on already existing graffiti styles from Europe or America, Ashekman combines Arabic graffiti, urban graphics, calligraphy and Lebanese proverbs. Their street art is derived from the Arabic hip-hop scene. It consists of Arabic Graffiti (merging the common graffiti with Latin type to create a new style that includes Arabic typography) derived from the Kufi, Diwani, and freestyle Arabic fonts. Kufi was the dominant priestly script around 8th century A.D. It has specific proportional measurements accompanied by prominent angularity and square shapes. Kufi has extended horizontal lines contrasting low verticals making it considerably wider than it is high. This gives it a unique dynamic momentum, which is the reason why it’s often chosen for use on four-sided figures. Because the Kufi script was not subjected to strict rules, calligraphers had virtually a free hand in the conception and execution of its ornamental forms. Diwani script was an Ottoman development that was a favorite for writing in the Ottoman chancellery. It is excessively cursive and highly structured with letters that are not dotted and unconventionally joined together. It uses no vocalization marks in contrast to modern Arabic writing where various letters are dotted and vowel marks are an essential part of the script. Diwani was also highly favored for ornamental purposes. The obvious ornamentation of calligraphic influences coupled with modern freestyle type derived from Arabic typography has led to appealing results on street walls in Beirut. In no way is this process stagnant; more and more experimentation with letters, shadows and type is evident. This is a mirror of the typographic development of today where it is no longer dominated by the few intellectuals for the intellectuals but rather by all for all. Street art is a prominent way to reflect the advancement in Arabic typography and in turn have the freestyle nature to inspire more developments from the street. Lebanon’s civil war imparts a complex situation where confessional, cultural and economic regional and local conflicts have characterized various opposing ideological frameworks and distinguished numerous militant groups. This has consequently produced a complex and rich basis of street visual iconography and aestheticism. This new generation is expanding all of this image culture even more. Changes are systematic and intertwined – designers are being integrated in society, artists are being respected for their work and opportunities for creativity are growing. The days when esteem and value of society was channeled through classic métiers like Doctors, Engineers and Lawyers are finally gone. This is very evident amongst the youth that are creating change the fields of art, design, film and music. All this emerging graffiti is a reflection of this migrating society. They portray on one hand the artistic vision of an individual or a group, and convey on the other, the spiritual, social, political and economic aspects of that individual’s society at a particular point in time. One proof that this has been extremely appreciated and admired, is the fact that the police in Beirut do not stop these graffiti artists, they just leave them to it. Beirut really will not die!